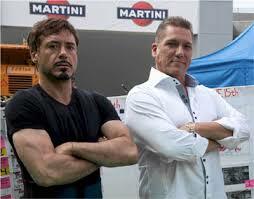 HomeCan Iron Man Artist Bob Layton Save Florida’s Film Industry From Runaway Production? It’s no secret that the best days for filming in Florida are behind it. Thanks to some high profile failures by Digital Domain, and Florida’s State Assembly choosing to let production tax incentives lapse, Hollywood is looking to the Sunshine State’s neighbors to do all their filming (such as Atlanta). But Bob Layton, a legendary comic book artist and writer, known for his work on Marvel’s Iron Man thinks its best days are ahead, and he has a plan to get the state there. Bob Layton is supposed to be winding down, but at the age of 63 and still at the top of his game, you’d think with his recent move back to Florida, he’d want to take it easy. But with Layton, that’s not the case; it’s more like a shark swimming. Stop swimming and you’re dead. Layton and writer David Michelinie spearheaded two excellent comic runs of Iron Man in the 1970s and 80s, and Layton was also closely involved with Valiant Comics before moving from New York to Florida about 20 years ago. Last decade, he moved to L.A. to develop film projects as a producer. Recently, he moved back to the state to be closer to his family, but he thinks he can help save the state’s dying film production industry. Layton says that in spite of the fact that the Sunshine State has no tax incentives to make filming there more attractive, the assembly there has failed to renew tax incentives for the fourth straight year, while neighboring states like Georgia and Louisiana are increasing their tax credits to lure production companies. Layton was in L.A. during the dark times when a similar insanity gripped the state legislature. But then they finally saw the light and tripled incentives, and now production is back up in L.A. So Layton wants to make Florida the east coast Hollywood, a place where production companies can have their base of operations. To that end, he’s created CEA Group, an entertainment investment firm based in Tampa, and he hopes that as his company grows, he’ll be able to lobby state assembly members to revisit the tax incentives, or at least lure more companies to the state to show that Hollywood really does want to film there. With his partner Agnes Lee, whom Layton met at New York Comic Con last year, they’ve been making the rounds trying to revitalize the Florida’s film industry with Tampa as its base. So far, they’ve managed to convince the Florida Film Commission that to give it the ol’ college try. Layton has a plans for a set of ambitious slate of films, and if he can’t get Florida on board with tax breaks, he’s planning convincing his investors to film there anyway and make it up on the back end. The man has a vision, there’s no denying that. But can he infect others in the Sunshine State with it? Only time will tell.